Maasai Mara Game Reserve is one of the ‘must visit’ place for any wildlife enthusiastic who would like to see the Savannah wildlife. The park is very big, 1,510 sq km(580 sq miles) and raises 1,500-2,170 meters above see level. Its not possible to cover the park within a few hours, so if you want to embrace all the park has to offer you got to plan your adventure to cover a few days. Hence, the question arises of where am I going to stay during this time am exploring, what kind of hotels are there in the Mara and how do I book? If you try to search for Maasai Mara Hotels on the internet, you might not get an actual hotel which might disappoint you. This is because there no actual permanent structures in and around the Mara due to ecological reasons. The place has tented camps and lodges in place of hotels. Well the thought of leaving in a tent in the wild does not really resonate well with most people who have not been in the Mara before(my mother falling in this category). There is the fear of being attacked by the same wildlife you came to watch or the bugs and insects in the area that can easily claw in. The tents and lodges are built in the traditional way, meaning that they have the outward look of a tent (as the door is replaced with a zip) but the inside structure is a well-built hotel room. They are always well lit and very secure, no animal can come near the camp. This lodges and camp also vary from 5 star look to those suitable for a budget safari. 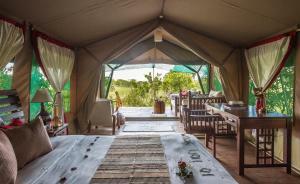 Booking is definitely done same process as hotels, even some big hotels in Africa have tented camps here in the Mara. Some of these tented camps are found inside the game reserve while others are located at the border of the Mara. Safety is definitely assured as animals keep their distance but humans too should keep their distance away from the animal space. How safe am I in a tented camp? Well in the wild we have the herbivorous animals and the carnivorous animals. Mostly the carnivorous animals keep their distance from human settlement as they know humans are enemies but the herbivore like the monkey, zebra, impala come to graze even near as they know humans do not pose a danger to them. Hence, you are extremely safe in the tent except for the many animal noises you will hear at night and maybe some monkeys or baboons who might visit and steal some foods. It is however very crucial not to leave the camp without a guide even if you have the urge to go for a jog in the jungle, Maasai Mara is a no for such. Always follow instruction as given by the camp attendant because the area is a wild animal territory and its not easy even for the game rangers to know every move the various animals intend to take. How do I see all the animals? Game drive in designated vehicles most with an open roof top. A balloon safari which need to be arranged in advance. No one is allowed to walk in the park and there are various warnings in the park for people not to leave their vehicles and stick to the marked paths. Best time to see the animals in their true nature is in the morning when its most likely to see a kill happening or in the evening when they come out from their resting place from the scotching sun. How do I maximize on seeing all the animals in the Mara. Well Maasai Mara Game Reserve is one of they few parks that have all the Big 5 (Lion,Elephant,Buffalo,Rhino,Leopard)in it. When doing the safari, always aim at seeing all these animals. To be able to achieve this you either need more days to maximize covering the whole park or you can opt for a full day game drive with the option of a picnic in the Mara grasslands. This is one of the packages offered by the various lodges in the Mara. There is quite a good coordination between the tour drivers and the park rangers and they always communicate while they are maneuvering through the park. This helps them spot where the big animals are and also make sure no one is left stranded in the park. The wild beast normally migrate from the Serengeti Game Reserve in the neighboring country Tanzania to the Maasai Mara through the crocodile infested river Mara. They normally do these in thousands of numbers. It has never been understood why they do these but it is really a wonder to see these animals cross. This is one of the biggest event in the Mara which happens once a year between the months of July and August. This is normally reserved for the big animal production houses like the national geographic and the big cat diaries crew but if you are determined to attend the event you can try your luck. The only disadvantage is that it is not certain at what time the animals actually move so people have to camp there for days going to weeks waiting for the animals to move then in a span of hours the event is over. How do I get to the Mara? From the main airport, your travel agent can organize for your pickup via road to get to the Mara by road. These normally takes 4-5 hours as one views the country scenery. There is also the option of chartered small aircraft or helicopters that can get you direct to the Mara in an hour or less depending on the travel package you choose. Pointers when at the Mara. Aim to see the Big 5. Get a good zoom in camera to get great photo memories. Insist on early morning or late evening game drives as that is when you get to see the animals at their best. Always get a guide who is from the local area to learn more about the place. Have an adventurous spirit as this is a very rough terrain and needs one not to be fainthearted. I love to camp, so this sounds perfect. I have never been to Africa and its on my bucket list. You made it sound Beautiful and Adventurous. I have always heard of the big 5 but I think personally I would love to check out the little creatures. I happen to like bugs. I understand there are all kinds. Checking out the monkeys would be awesome but I am sure if one came close I would scream louder than it could holler. Can you tell me about the lizards over there? I would love to know what kind could be seen. You will love it in Africa, especially if you love bugs lol…they are everywhere. Monkeys too are everywhere and can sometimes turn to little terrorists, screaming would actually amuse them. Am not a fun of lizard but i would definitely research and maybe do a post on the same. I love this post and your site! My wife and I are both retired and one of the things on our list of must do, is to go on an African Safari. I will show her this information as well. I can’t wait to go and stay at this place. This post made me so excited & immediately interested. I love anything to do with travel & I’ve always wanted to go on a safari ever since I heard some of my friends tell me their experiences with the animals walking right up to them & all sorts of fascinating tales. This was very informative & I’ll be sure to save this website for when I actually manage to go on a safari. (It will happen one day, I’m determined!) Thanks again for the wonderful post! You are welcome, glad you found good information to plan your travel. When the time comes i hope you have a wonderful travel whichever destination you choose. I have always been curious about where to begin a travel to Africa! And reading your post makes me feel Maasai Mara would be an interesting option. I like the concept of tented camps, very original! Maasai Mara gives such an awesome experience, you will love it. Most game lodges in Africa embrace the tented camp concept for ecological reasons even engaging top designers to come up with state of the art rooms. This sounds like a wonderful place to visit. I would love to see these animals, but I am also very frightened that they might attack me. I don’t mind the monkeys. But lions and tigers, oh god no. Thank you for sharing this beautiful place. I will pass this article to people who love camping. Well, you actually don’t get in contact with the animals when in a game park you just watch them while in a tour van. The sound of the van engine keeps them at a distance so they don’t attack just follow the instructions as given by the tour guide. Actually, elephants are more feared than even the big cats though they don’t attack unless provoked. You should overcome your fears by going on a safari. Yes, its quite an adventurous experience you should visit. The komoto dragon lizard is found in Indonesia but there are other types of lizards found in African just that in such a terrain unless you are very keen you might not notice them as the big animals tend to overshadow them hence they keep a low key. Great info. I have never been to Africa but would love to. I’m not fond of zoo and would love to see these animals in their natural habitat. Love the accommodations, would like that on the next family camping trip (lol) Is this year round and is there a peak season? Well seeing animals in a game reserve is quite a different experience from going to a zoo as in a reserve the animals are living and surviving on their own terms. Well for Maasai Mara, peak season is between July-August during the wild beast migration. In the month April-May there are heavy rains hence not a good time to take a game drive but the rest of the year can be considered a good time. Your family will love the safari. Am glad you had an amazing experience you should try The Amboseli or Tsavo next. My latest articles covers more amazing places. While I am not accustomed to this terrain, living in a tent sounds so wonderful.It sounds like they educate you and support you enough to be and feel safe within the tent. I would love to see these animals in their wild habitat. I have only ever visited zoos before and it is just not the same as the real thing. I would be interested in learning all about their behaviors, all animals big to small. Thank you so much for sharing, I will be bookmarking this page for sure! Book that safari, you will really love it in the wild. It is a whole new experience from the zoo, watching wildlife survive on their own without human interference. I’ve been a lover of animal since from my childhood days. My father usually take me on a trip to a zoo that was located in a neighboring town. I loved the experience and I usually look forward to the next. Judging from the way you explained the Maasai Mara Game Reserve. I think it is worth the visit. You should now graduate from visiting the zoo to seeing wildlife in their natural habitat without human interaction, it helps you appreciate nature and animals in a whole new way. Add a safari to your bucket list. A safari would be a great way to experience exotic animals in a natural terrain that a zoo just can’t replicate. However, it does seem important to go with an experienced guide for safety reasons. It’s good to hear that the animals are most likely to be visible at the beginning or end of the day, as it would probably be too hot to go out exploring in the middle of the day in Africa. Yes, a safari game drive cannot be compared to a zoo experience in anyway. There are very experienced guides that are provided by the game lodges and most of the time come as a package as it is the main reason for visiting the place. The wildlife also do feel the heat hence during the day they stay away in the bushes resting and only become active when the temperatures cool down in the morning and evening with some being active all night long. Hi Anita, the thought of staying in a tented house in the wild, especially where I have not visited is a little bit scary. However, you have a valid point about carnivorous animals keeping their distance from human settlement. I love everything that has to do with wildlife, however, I don’t prefer lodging too close to Game Reserve, I prefer visiting and going back that same day, perhaps to the nearest city within the location of the Game Reserve. It is encouraging to know that one can actually be safe in the tent irrespective of animals noises. Thanks for your great review. Well, this is an adventure for those who love nature, the idea of being surrounded by wild animals and living among them creates so much thrill and excitement. Unfortunately, to have the ultimate Maasai Mara experience to you have to spend in the lodges near or inside the reserve as the area is wide and exploring it can take a day or two. It is also far from the city hence not possible to achieve a good game drive experience within a day but I can assure you it is safe and fun to stay in the lodges, everyone leaves with a positive attitude and much respect to nature. Living in Africa, I can agree that the Big 5 – known for their rarity – are the best animals to put on your list first. During the stay you will definitely see other wild life as you travel by car in designated areas. I like the idea of a building behind the facade of a tent, it makes one feel safer and I like the mosquito netting which should keep out those pesky insects too! It’s good to take an insect repellent so that you are not bothered by mosquitos because they are persistent and won’t let up unless you have put on something they don’t like. Did you know that lavendar also repels mosquitos? You are very right. Watching wildlife while on a game drive while living in a tented-lodge is an experience worth your money even if it is once in a lifetime. Insect repellent and sun screen are a must have when going to the wild in Africa. Yes, lavender does repel mosquitoes but i wonder if it can attract bees while in the wild. Well for anyone who loves nature knows that it is not environmentally friendly to build modern hotels in the wild, it kills the whole idea of preserving nature. 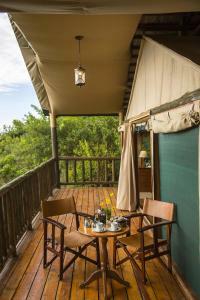 Hence, the choice of Eco-friendly tented lodges which have the same capacity as hotels. We have game rangers in the Mara whose sole duty is to protect wildlife rather than people as the wildlife are more threatened by humans not the other way round. Wildlife can never harm human as long as you don’t interfere with their way of life. You should try a safari once in your life and I can guarantee it will change your perspective towards wildlife.